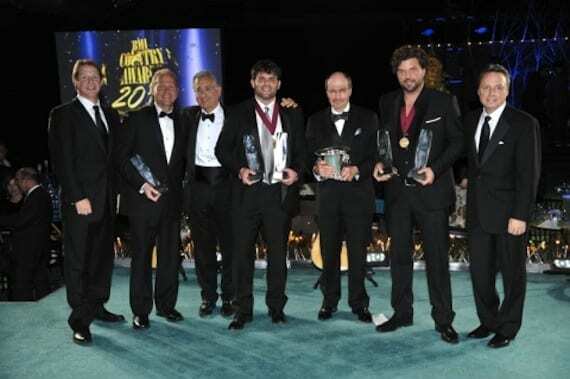 Pictured at the 2011 BMI Country Awards are (L-R): BMI’s Clay Bradley, Publisher of the Year Sony/ATV Music Publishing’s Troy Tomlinson, BMI President & CEO Del Bryant, Songwriter of the Year Rhett Akins, 2011 BMI Icon Bobby Braddock, Songwriter of the Year Dallas Davidson, and BMI’s Jody Williams. Broadcast Music, Inc. (BMI) celebrated the songwriters and publishers behind country music’s most-performed songs of the past year during last night’s (11/8) 59th annual BMI Country Awards, staged at the organization’s Nashville offices. Rhett Akins and Dallas Davidson shared the Songwriter of the Year crown. The frequent collaborators co-wrote four of the year’s most-performed songs: “All About Tonight” (Blake Shelton), “All Over Me” (Josh Turner), “Gimmie That Girl” (Joe Nichols) and “The Shape I’m In” (Joe Nichols). Individually, Akins’ “Farmer’s Daughter” (Rodney Atkins) and Davidson’s “Rain Is a Good Thing” (Luke Bryan) also made the list. “All Over Me” also earned Song of the Year honors for Davidson and Akins, as well as publishers EMI-Blackwood Music, Inc., Rhettneck Music, and String Stretcher Music. Bobby Braddock was saluted as a BMI songwriting Icon. Braddock is the master craftsman behind staples including “He Stopped Loving Her Today,” “People Are Crazy,” “D-I-V-O-R-C-E,” “I Wanna Talk About Me,” “Old Flames Have New Names,” “Golden Ring,” “Time Marches On” and more. He is a member of the Nashville Songwriters Hall of Fame and the Country Music Hall of Fame. Braddock is the only living songwriter to have penned chart-toppers in five consecutive decades. Taking the stage to perform some of Braddock’s classics were Pistol Annies, Blake Shelton, John Anderson, LeAnn Rimes and Vince Gill.